Accolade were one of those short-lived late-'60s / early-'70s English bands that attempted to expand musical boundaries, completely eschewing electric instruments to mix traditional English folk with rock influences. They recorded two albums and one single before going their separate ways, but Gordon Giltrap remained for only this one album. In one respect the band (bassist Eden Abba, woodwind player Brian Cresswell, singer / guitarist Gordon Giltrap, drummer Ian Hoyle and guitarist Don Partridge) was quite different from many of their contemporaries - namely they were brimming with talent. Prior to their collaboration in Accolade, both Giltrap and Partridge had enjoyed some solo recognition. Giltrap had released a pair of critically praised solo albums, while Partridge (who was actually working as a busker ) enjoyed a fluke UK hit with the song "Rosie". Unfortunately, Accolade's pastoral stylings guaranteed instant obscurity in the States. In fact, it's somewhat of a mystery how they even got their 1968 debut released by Capitol (a label hardly renown for its willingness to take a chance on cutting edge sounds). 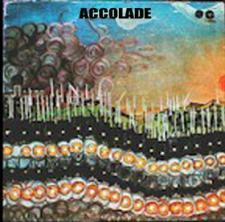 Produced by Don Paul, 1969's cleverly-titled "Accolade" is hard to accurately describe. Recorded with former Artwoods bassist Malcolm Pool replacing Eden Abba, the collection exhibits a smooth and calming sound throughout. Largely acoustic (though you don't really realize it), material such as "Maiden Flight Eliza" (featuring some weird Mamas and Papas-styled harmonies ), "Prelude To a Dawn", the bluesy "Nature Boy", the surprisingly hard rocking "Gospel Song" and "Never Ending Solitude" wasn't exactly mainstream rock, nor did it fall under the banner of Fairport Convention-styled English folk. Imagine well crafted cocktail jazz with the addition of a touch of English folk and you'll get a feel for the LP. While that doesn't sound like a ringing endorsement, the result is actually a fascinating album.